1 Place the rice, coconut milk, milk, 100g of the sugar, half of the ginger, 600ml water and a pinch of salt into a large saucepan and bring to a simmer over a medium heat. Reduce the heat to low and cook for 1 hour 15 minutes, stirring regularly, until the rice is tender. 2 Meanwhile, preheat the oven to 180°C, gas mark 4. Line a baking tray with baking parchment. Combine the remaining ginger, coconut oil and remaining sugar in a large bowl. Add the rhubarb and toss to coat then set aside for 5–10 minutes at room temperature. 3 Transfer the rhubarb mixture to the prepared baking tray and spread out in a single layer. Cover with more baking parchment and place in the oven for 10–15 minutes until tender. Remove and set aside to cool slightly, or completely, if you prefer. 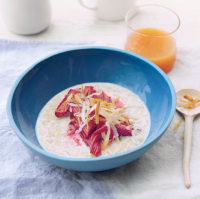 4 Serve the rice hot or cold with the rhubarb, its syrup and the toasted coconut. Add more milk to loosen, if serving cold. Drizzle with extra cream or coconut cream to serve, if you wish. For a dairy-free option, use rice or almond milk in place of the skimmed milk. To toast the coconut, dry-fry in a pan over a medium heat, turning often, until starting to colour slightly.